Download a free Hitran-PC 4 Demo version and user manual. Hitran-PC Version 4: Bug list, fixes and update history list. gases using primarily the HITRAN Line-by-Line molecular absorption database. 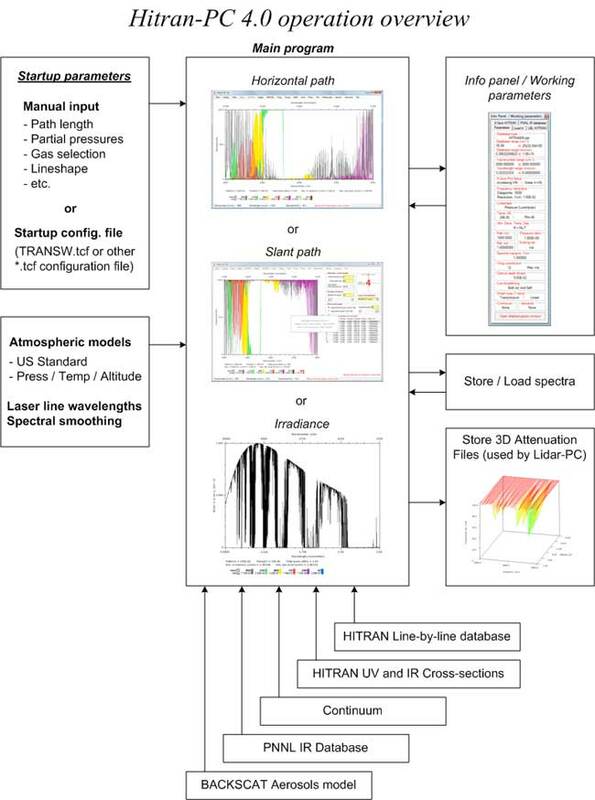 Hitran-PC has been developed over the past 20 years with application toward the modeling of the transmission and absorption of a laser beam propagating through the atmosphere. Hitran-PC has been developed with various levels of improvements and capability, starting with Version 1.0 in 1991 through Version 4.0 in 2009. The latest version uses the 2008 HITRAN Line-by-Line database, but also uses the HITRAN UV and IR Cross Section files, the experimental PNNL IR database, aerosol extinction using the BACKSCAT program, and the water vapor, CO2 and N2 Continuum. The following figure is a transmission of the atmosphere from 3.3 to 5 micron in wavelength for a path of 1000 meters. The transmission (and absorption) spectrum of the atmosphere can be calculated over a spectral wavelength range for a given path length, using supplied models of the atmosphere (i.e. US Standard Atmosphere) or user specified pressure, temperature, lineshape (pressure, Doppler, Voigt), and partial pressures of a variety of gases as a function of altitude, and for horizontal paths and slant path geometries. In addition, the user can select one or more specific gases or isotopes in order to study the individual spectrum for those particular gases. The irradiance of a gas plume or a hot target through the atmosphere can also be displayed. The user can smooth the resultant optical spectrum to simulate the finite resolution of an optical instrument, or overlay known laser lines to help decide which to use for atmospheric laser remote sensing. The overall operation of Hitran-PC 4.0 is shown in the following figure. As can be seen, the user can specify the path length, temperature, concentration, line shape (Pressure, Voigt, etc. ), and other parameters pertaining to the transmission of the atmosphere. These startup parameters can also be stored in a configuration file for easy use at a later time. The startup parameters are then used along with atmospheric models of pressure/temperature/altitude to model the geometry of the optical transmission path through the gas or atmosphere. Both horizontal and slant path spectral calculations can be made. In the figure, the Main Program screen is shown, along with the Info Panel which contains the Working Parameters for the input parameters and databases, for easy modification and control by the user. 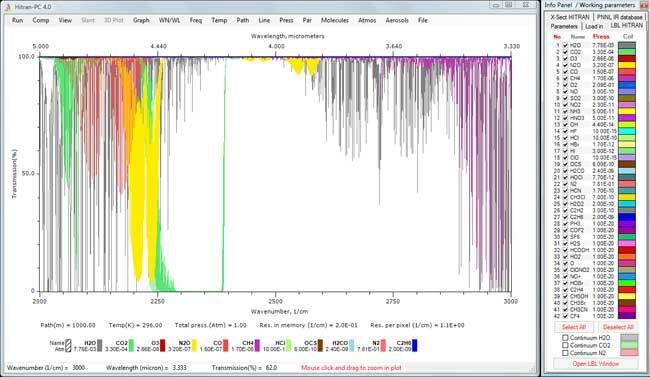 As can be seen in the figure, the top screen of the Main Program is shown for a typical Horizontal Path calculation showing the color coded absorption spectrum of individual gases. Another option is shown in the middle screen which displays the slant path calculation of the transmission as a function of wavelength. In this mode, the user can easily insert a gas plume or cloud of a specified gas (i.e, from the PNNL database) into the optical path at a specified range. Finally, the program can also calculate the radiance for a hot target or a gas plume as shown in the lower example. (5) the BACKSCAT (Version 4.0) attenuation due to aerosols (clouds, fogs, dust) which is the same as the US Air Force LOWTRAN7 model. Hitran-PC 4.0 uses the HITRAN LBL as the main calculation for atmospheric attenuation, but allows the user to add in the other spectral contributions also. For example, the user can specify the HITRAN LBL for the transmission of the atmosphere, add in the attenuation due to fog or urban haze, and then use the PNNL database to add the attenuation of a 10 m plume of a particular gas at a specified range. The calculated spectrums can be stored in data files, for further use by the user. → HITRAN 2008-2004 format database usage on CD/DVD, or a harddrive, etc. → Improved "Slant path layer editor"
Hitran-PC uses the HITRAN database for transmission simulations. The HITRAN database is maintained and distributed by the Harvard-Smithsonian Center for Astrophysics. If you would like to learn more about the HITRAN database please visit www.hitran.com. To download the HITRAN database free of charge from the Harvard-Smithsonian Center for Astrophysics, you need to fill out the following request form at their website. The PNNL IR database was developed and distributed by the Pacific Northwest National Laboratory. If you would like to learn more about the PNNL Infrared database please visit PNNL IR database website. The PNNL database is released on the following conditions.